Monday started with physical therapy and occupational therapy appointments at the Dean West clinic in Madison. We’re trying to figure out what is going on with my knee and so far the mystery remains unsolved. They’ve given me stretches and exercises to strengthen my left leg muscles without putting stress on the knee. To be honest; my knee is actually worse now than it was before I started seeing the physical therapist. I am in no way saying that the exercises I’m doing is making it worse, but for whatever reason it’s painful to walk and extremely painful to go up stairs. I *can* make it up stairs without the assistance of a railing, but it’s a struggle. I was an all-conference defensive back in high school, and right now I feel like anybody’s grandmother could beat me on a go route, a slant, or a fade. Pretty much any route, come to think of it. I left our apartment on the west side of Madison at 3:00 pm. I stopped for gas before getting on the beltline, stopped for a Jimmy John’s sub in Lake Mills, and pulled into the Brewers 1 lot at 4:40 pm. I proceeded to eat the aforementioned sub then gingerly walked the preferred parking lots handing out some cards. I really wish I could get back to the general lot more often, but with the way my knee is feeling I might need to invest in a segway for that to become a routine. I had listed my extra ticket for Monday’s game on Twitter before the road trip, and found a buyer shortly thereafter. Brandon was my partner in crime for the game, and Be The Match will be getting another $30 donation thanks to him. All the Little Leaguers (and their coaches) get to walk around the warning track from foul pole to foul pole. This meant that there were parents all over the place trying to get pictures of their kid(s) on the field. It made it a little tricky but luckily there weren’t any in the front row of 223, where I stood to get game photo number 67. I’m not saying the Brewers shouldn’t do this, because I think it’s awesome that they do it, I’m just saying it changed how I went about things. It was hot and sticky and I was svitzing like pig (or whatever the kids are saying these days). I am this →||← close to getting rid of my “facial hair” and shaving my head. The original plan was to make it the entire season, so that the game number photo slideshow would show progressively longer and longer hair and facial hair, but I’m not sure I can put up with this. The person who is smiling ear to ear as she’s reading this is my wonderful girlfriend Victoria, who has voiced her opinion that I should’ve gotten rid of “it” weeks ago. I hate losing, and me getting rid of my joke of a beard will mean that she won. We’ll call it a tie, and I’ll tell myself that there were extenuating circumstances. After getting the game number picture Brandon and I were waiting near section 214 for the Ice Man to appear. I’m guessing he had taken the day off because I never did see him. 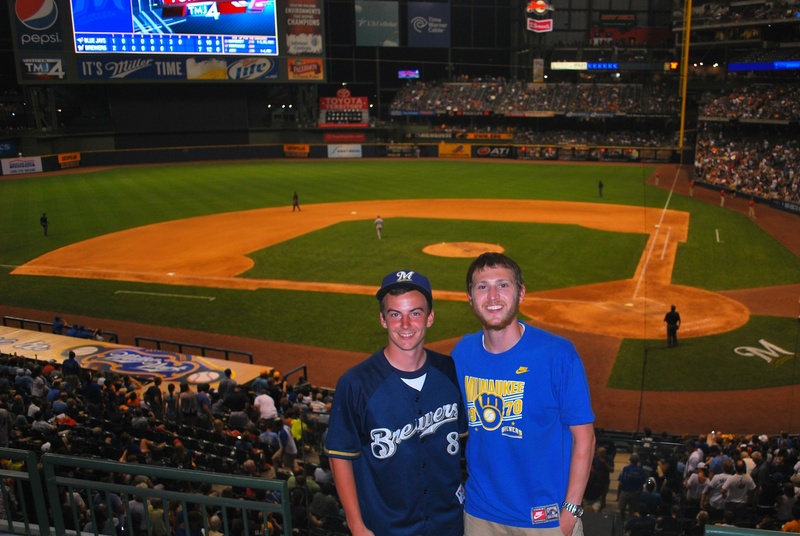 We did see Jill Aronoff, however, who is the Senior Director of Merchandise Branding for the Brewers. She said she had the replacement case for me and went back to the executive offices to get it. I had notified her that the case they had made for me was breaking down, and she said they would swap it out. She had taken the case from me earlier and showed it to some of the manufacturer’s representatives. They said that a substance must have gotten on the case, because they had never seen the type of wear that was visible on my case. I have in the past used hand sanitizer on my phone and cases, and I’m guessing that’s what I had done. Phones are known to have A LOT of germs, thus my precautionary measures (hey, I have the immune system of a 2 and half year old, sue me). 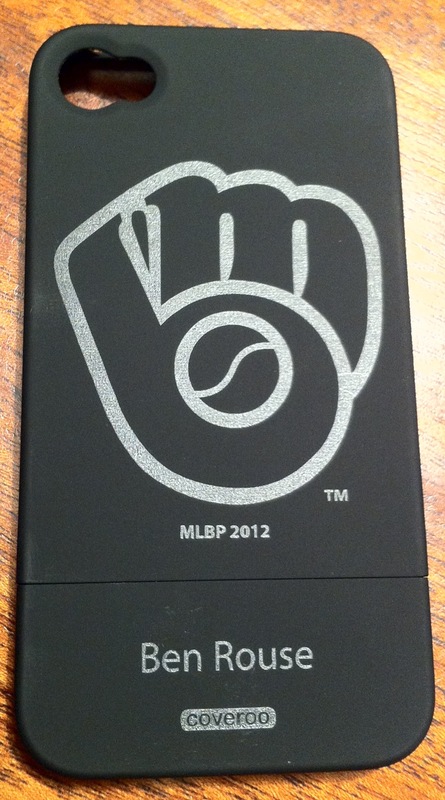 So if you’re going to go to the team store to have one of the below cases custom made, don’t use hand sanitizer on it. They are really cool, and if you want one you should check it out at the team store in the left field corner of the field level concourse. “Front Row Amy”, who sits right behind home plate for about 45 home games a year, offered me her ticket to a game this year. I met up with her before the game on Monday to get the ticket for the August 21st game against the Cubs. It’s one ticket, and I’m looking forward to getting a different perspective on the action. This also means that I will be auctioning off my TWO tickets to the Tuesday, August 21st game. I’ll be donating the money to Be The Match, so if you’re interested in sitting in my seats for that game (section 221, row six), let me know what you’d be willing to donate. I’ll be mentioning it on Twitter as we get closer to that date, so if you don’t use Twitter you can leave a comment now or in a future post. Brandon and I got to our seats just before the National Anthems, and we noticed this up near the roof. 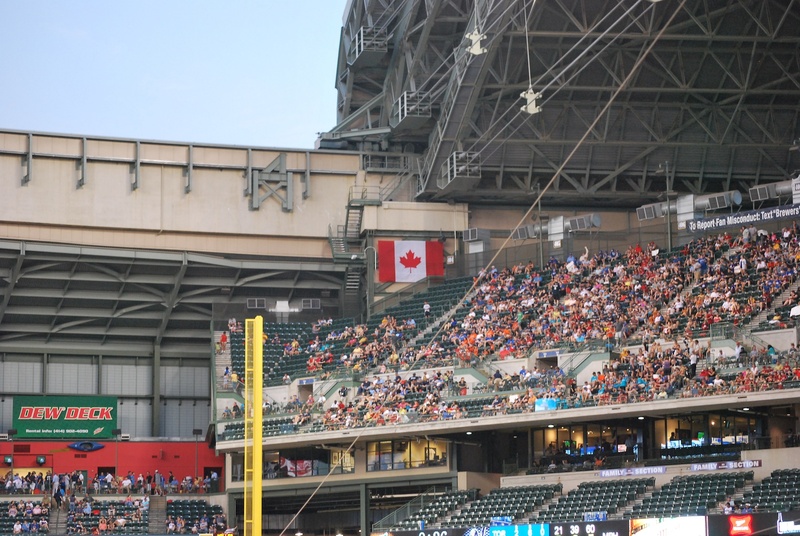 You may have noticed that I said Anthem[S], and that’s because the Brewers were taking on the Toronto Blue Jays, and both “O Canada” and “The Star-Spangled Banner” were sung before the game got underway. The game started off great, if you were a Blue Jays fan. Brett Lawrie, who in addition to some other minor league prospects at the time, was traded to the Blue Jays for Shaun Marcum in the offseason leading up to the 2011 season. On the second pitch that Lawrie saw, in the stadium that he almost called home, he sent an opposite field home run out to right center to give the Jays the lead. 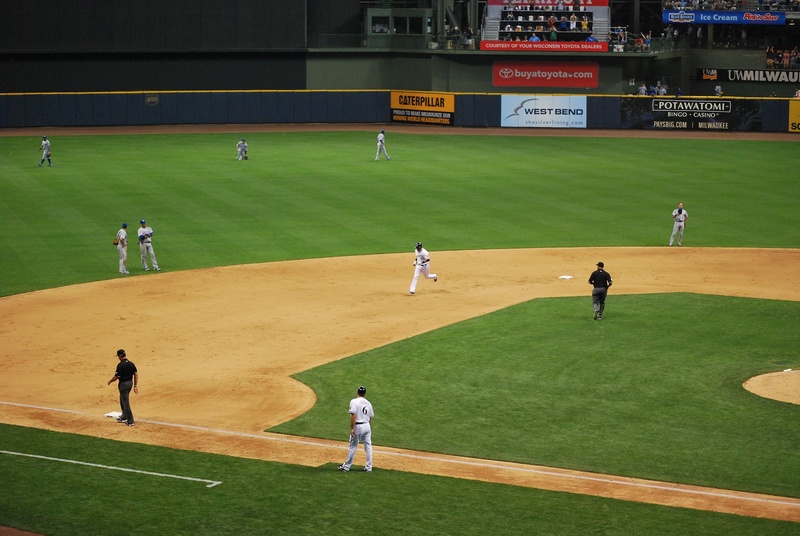 In the bottom half of the first inning the Brewers came right back, and on a full count pitch Rickie Weeks drove one to the outfield to drive in two runs. This was the swing that resulted in the hit. Even though you can’t see the ball I promise you he made contact and drove in T-Plush and Braun. In the bottom of the second it got even better for the Brewers. They scored four runs on a safety squeeze turned single from Aoki, an RBI fielders choice grounder from Braun, and a two run double from Ram-Ram. 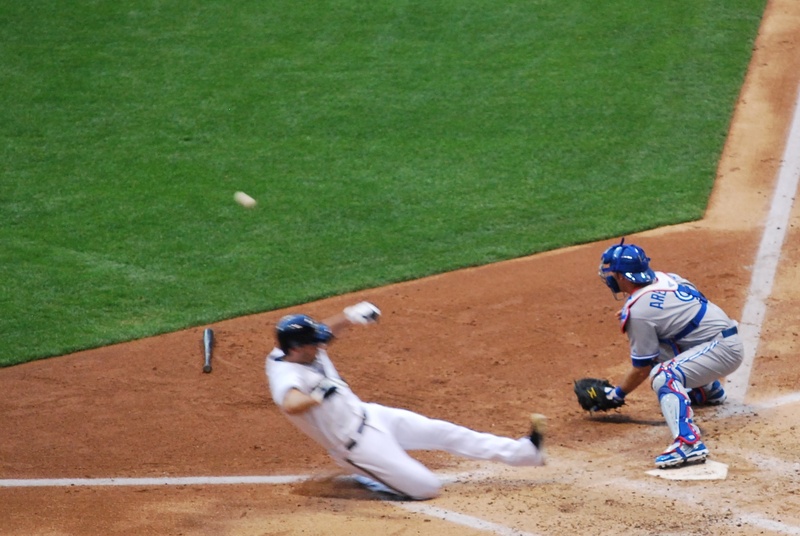 Braun was safe at home on Ramirez’s double, and it was a (somewhat) close play. I apologize for the lack of clarity in Braun’s figure. I yelled “SLOW DOWN, I’M TRYING TO GET A GOOD ACTION SHOT!” I think it just made him go faster (at least the catcher and the bat listened). The Jays scored a run in the third on a double play groundout from Encarnación. In the sixth he made up for the GIDP (grounded into double play) with an absolute BOMB to left field. It hit the inside of Bernie’s slide and then bounced down into the loge bleachers. I remember listening on the radio when Brandon Phillips of the Reds did it back in 2005 (or at least I think it was in ’05). Encarnación’s blast pulled the Jays within three runs at 6-3. In the seventh Brandon and I were hoping Kameron Loe could retire Colby Rasmus, as to not face Joey Bats (José Bautista) representing the tying run. Kameron missed low with a sinker on a full count pitch, and walked Rasmus. Bautista subsequently made him pay with a three-run game-tying home run that landed 15 rows deep in the left field loge bleachers. In the bottom of the seventh Aramis Ramirez led off and lined one down the left field line that hit some sort of wall. The whole stadium likely heard the smack as it hit the padded portion of the outfield wall. The third base umpire called it a foul ball, and Ron Roenicke came out to argue. Here he is with Ed Sedar as they discuss with the third base umpire where (they think) the ball hit. The umpires got together, talked about it, and then disappeared into the bowels of the stadium. 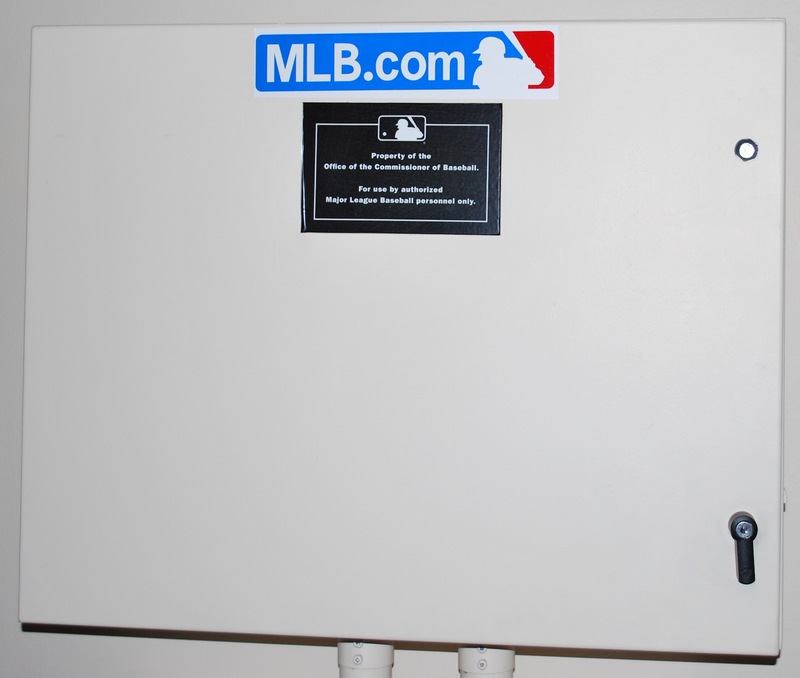 Since it was a potential home run, they are allowed to look at it, and they went to the video box where they are shown video replays from MLB headquarters in New York. I got to see one when I took the Coors Field tour on May 24th, and I’ve included below a picture that I took during the tour. After a few minutes the umpires returned and gave the home run signal. Aramis returned to the base paths, and proceeded to take his home run trot. Ram-Ram’s blast gave the Brewers a 7-6 lead. 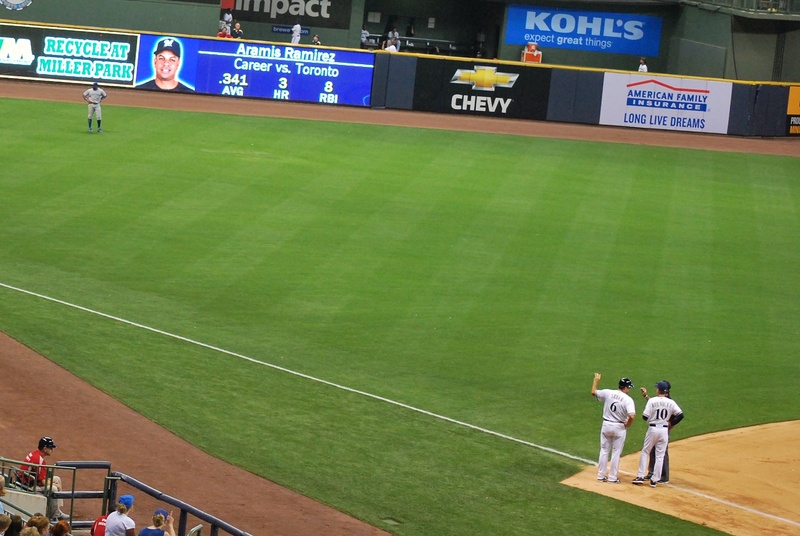 After a few great defensive plays (one by Weeks, two by Chart) in the top of eighth, the Brewers turned to Axford to close the door in the ninth. 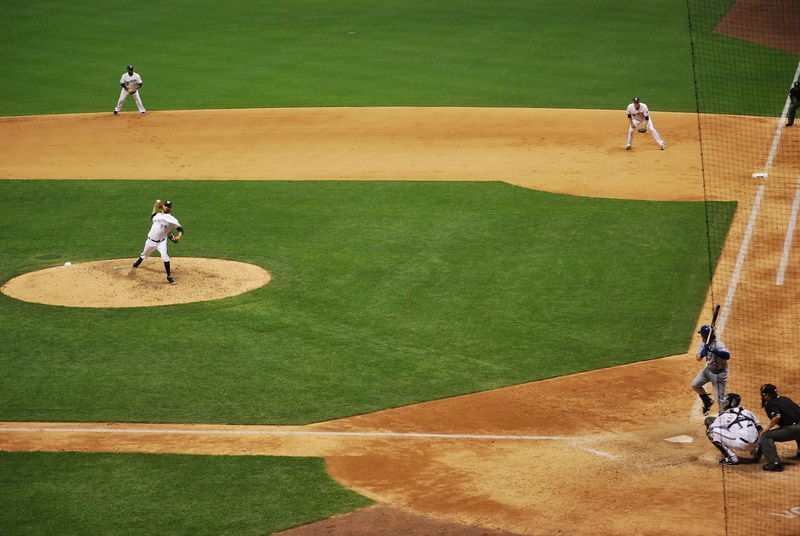 The above picture was taken as Axford was delivering his ninth pitch of the inning. 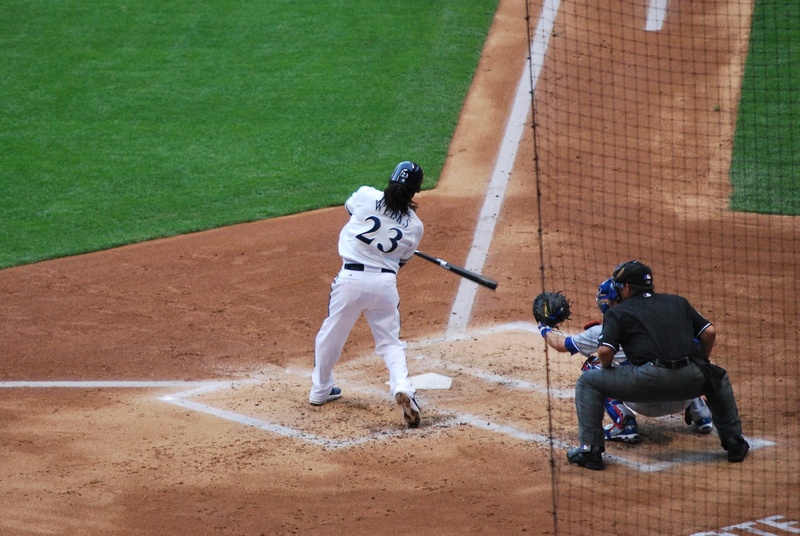 Colby Rasmus lifted the pitch to Braun in left for the third out of the inning, and the Brewers picked up a much needed W. Final Score: Brewers 7 – Blue Jays 6. It was an exciting game, albeit sticky and somewhat painful. In the middle of the eighth inning I had a fan a few rows in front of us take a picture of Brandon and me. Brandon is on the left and I’m on the right. 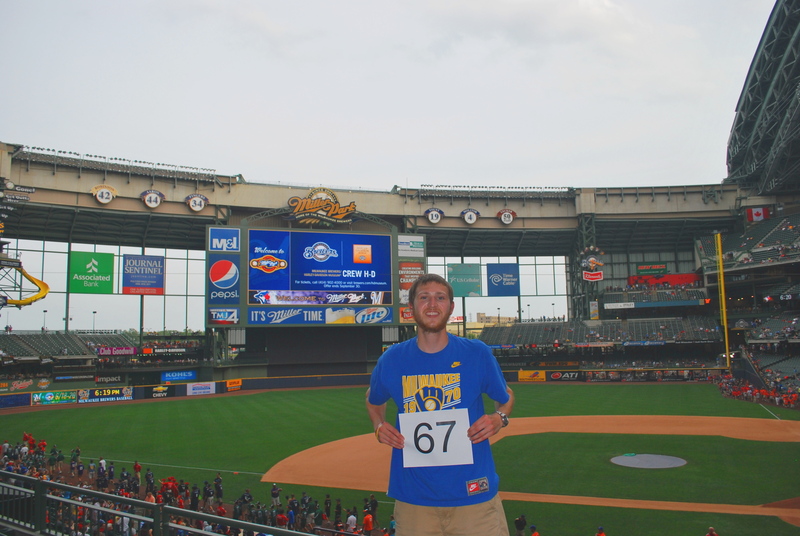 Besides the fact that Brandon is attending UW-Madison (my alma mater), he also attended 43 Brewers games the season that began in the Spring of his freshman year of college. That’s the same number I attended between my freshman and sophomore years at Madison. He’s a cool guy, a huge Brewers fan, and I wouldn’t mind sitting through another Brewers victory with him in the future. It’s past 2:00 am on Tuesday morning, and I’m going to bed. I’m driving to Delavan tomorrow before the game to visit with my Grandpa. It’s something that I’ve always done on Father’s Day, but the Brewers schedule dictates my availability, and I can’t change the schedule. He was one of my toughest critics before the season started (as to why I would waste six months of my life following the Brewers). As the season has progressed I really think he’s become quite proud of his only grandson. He even stayed up late when the Brewers were on the west coast to watch the games (and see if I made the broadcast). 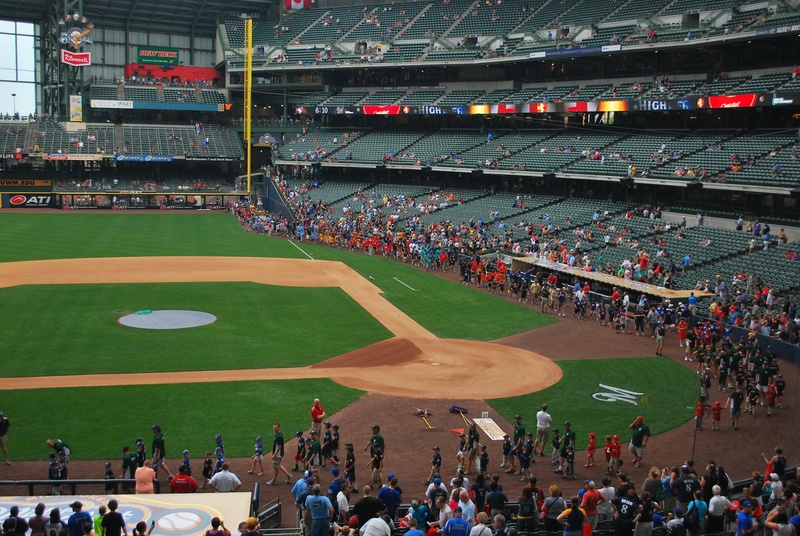 We’ll have some lunch, play some cribbage, and then it’s off to Milwaukee for game two of the series. I’ll have to agree with Victoria about ‘it’! Get rid of ‘it’. Have fun tomorrow with Steve.